Exciting news, Warriors! NERF just gave us the heads up on part of what they'll be talking about in the toy fair starting in a couple of days here. As you know, many of the new Nerf N-Strike Elite releases have been trickling into the stores with an official release in Spring of 2013. 1) The N-Strike Elite Stockade WILL be released here in Fall of 2013. The average retail price is supposed to be $21.99. May will remember that this is a Barricade re-do. If they stay true to the Elite line, it will should farther than it's parent blaster. Can't wait to mess with that stock! Who’s ready for more NERF action? Send NERF foam arrows soaring across the sky with the NERF N-STRIKE BLAZIN’ BOW toy. The BLAZIN’ BOW toy features an authentic pull-back bow design that you simply pull back, aim, and release to fire the NERF foam arrows. The BLAZIN’ BOW toy can hit targets from up to an impressive 40 feet away, and comes complete with integrated storage for two additional foam NERF arrows. 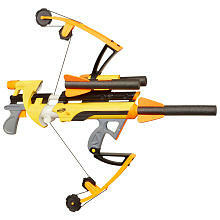 Includes three NERF foam arrows. Available at most major toy retailers nationwide and HasbroToyShop.com." Previously we've enjoyed the NERF Big Bad Bow that has been around in various forms since 1998 -in the NERF Hypersight brading. Many people have shortened the name to just "BBB". It's latest version and color scheme came out in 2011, released under the N-Strike brand. Over a decade later, I'm personally excited to see what may be new in the Blazin' Bow design! Looking forward to the care package NERF is sending us ahead of this weekend's New York Toy Fair 2013. By the way; Here are the two lates episode from the channel. 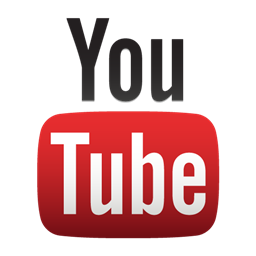 Feel free to subscribe so that you can keep up with us!